You know what I like to do when Colorado plays mean tricks on its locals and dumps foot upon after of snow in April? Eat. Specifically? 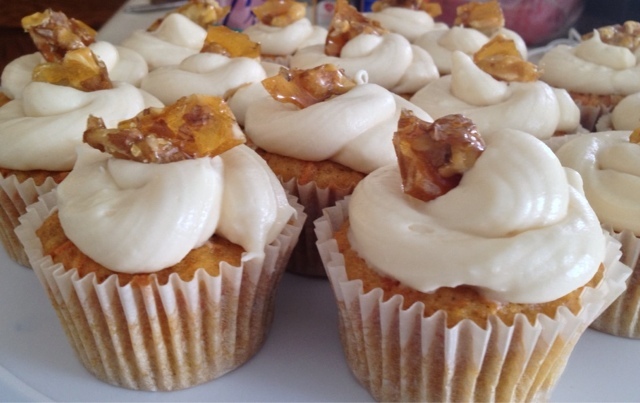 Carrot cupcakes. 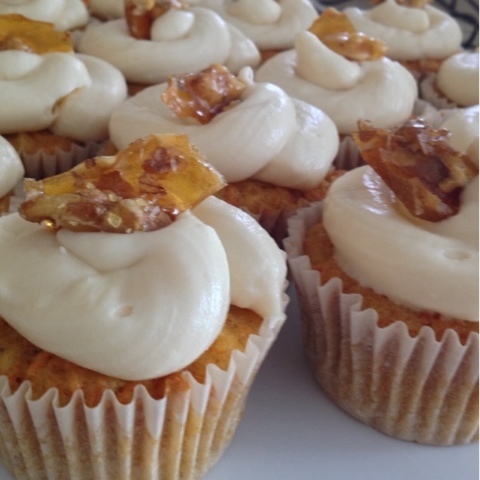 Let's all eat carrot cupcakes together because eating is totally the best way to get revenge on our state, right? I digress. 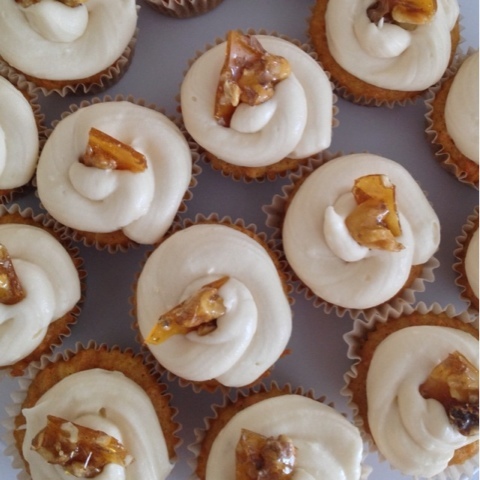 You should make these carrot cupcakes regardless (or in spite) of the weather. They are sweet without giving you a toothache. The orange zest keeps them tasting fresh and gives you an excuse to eat them for breakfast. The cream cheese frosting takes them to a whole new level, as cheese, butter and sugar often do. Honestly, these may be the best cupcakes I have ever made in my life. Now that's a big statement. Looks like your just going to have to try them out to see for yourself. Preheat the oven to 350 degrees. Toast all of the walnuts in the oven for approximately 5 minutes. While nuts are in the oven, assemble cupcake liners in a cupcake pan. Remove walnuts from oven and allow to cool. In a large bowl, combine carrots, buttermilk, oil, sugar, eggs, vanilla and orange zest and whisk thoroughly. In another bowl, whisk flour, baking soda, baking powder, salt, nutmeg and cinnamon. Fold the flour mixture into the carrot mixture until just combined (don't over mix). Fold in the walnuts. Scoop batter into cupcake liners, about 2/3 full. Bake for 19-21 minutes or until cupcakes are golden brown. Allow to cool for 5 minutes in cupcake pan, then remove and allow to cool on a rack completely. While cupcakes finish cooling, make the cream cheese frosting. Beat the cream cheese and butter on medium speed until well combined. Add vanilla and beat until fluffy. Add powdered sugar and salt and beat until incorporated (Tip: If you like cream cheese frosting to be a bit heavier and denser, like me, do NOT over beat. If you over beat, it will be fluffy- which isn't my favorite, but it may be yours). Frost cupcakes using a pipe with a rounded tip. (Tip: If you don't have a piping bag, use a heavy duty plastic bag, cut a small hole in the end, and tape the tip around the outside of the bag. That's what I do and it works pretty well.) 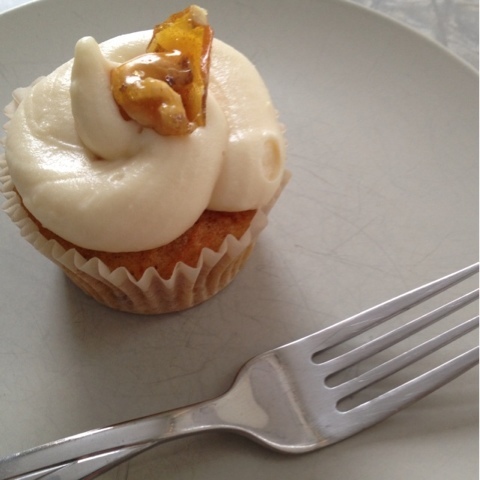 Top the cupcakes with candied walnuts for an extra touch! Be sure to store in an air-tight container in the fridge. Enjoy!